Unlike our September 2015 report on a rather lenient sentence of 120 hours of community service, the CMA has now secured the first disqualification of a director of a company found to have infringed competition law. Daniel Aston, managing director of the online poster supplier Trod Ltd, has given a disqualification undertaking not to act as a director of any UK company for 5 years. The Competition and Markets Authority (CMA) may, under the Company Directors Disqualification Act, seek the disqualification of an individual from holding company directorships where that individual has been director of a company which has breached competition law. This is the first time the power has been used for competition law breaches since it came on the statute book. The disqualification follows the CMA’s decision of 12 August 2016 that Trod breached competition law by agreeing with one of its competing online sellers that they would not undercut each other’s prices for posters and frames sold on Amazon’s UK website. The CMA found that the agreement was implemented using automated re-pricing software. The CMA fined Trod £163,371. As Mr Aston was the managing director of Trod at the relevant time, and because he personally contributed to the breach of competition law, the CMA considers that his conduct makes him unfit to be a company director for a specified period. Breaking competition law can harm consumers, businesses and overall economic performance. In this case, people shopping online were entitled to believe retailers were competing on price, whereas, unknown to them, the companies had colluded not to undercut each other’s prices. The responsibility to ensure that companies don’t engage in illegal anti-competitive practices is an important one, and company directors should not shirk that responsibility. The business community should be clear that the CMA will continue to look at the conduct of directors of companies that have broken competition law, and, where appropriate, we are absolutely prepared to use this power again. Under the disqualification undertaking, Mr Aston undertakes that for a period of 5 years, he will not ‘without the leave of the court be a director of a company or act as a receiver of a company’s property; or in any way, whether directly or indirectly, be concerned or take part in the promotion, formation or management of a company; or act as an insolvency practitioner.’ On 6 October 2016, the CMA served Mr Aston with a notice pursuant to section 9C of the Act setting out the grounds and evidence on which it proposed to rely in a claim for a disqualification order. Mr Aston has made oral and written representations on the proposed claim. On 21 November 2016, the CMA determined to bring proceedings in the event that no disqualification undertaking were given. Under the Company Directors Disqualification Act, the CMA has the power to apply to the court for an order disqualifying a director from holding company directorships or performing certain roles in relation to a company for a specified period if a company of which he or she is a director has breached competition law. The Act also allows the CMA to accept a disqualification undertaking from a director instead of bringing proceedings. A disqualification undertaking has the same legal effect as a disqualification order. Sections 9A to 9E of the Company Directors Disqualification Act 1986 as amended by the Enterprise Act 2002, which came into effect on 20 June 2003, gives the CMA the power to apply to the court for a disqualification order to be made against a director for a maximum of 15 years where a company of which he is a director has breached competition law and where his conduct as a director makes him unfit to be concerned in the management of a company. The disqualification undertaking is available on the CMA’s web page. Nigel Snee was today sentenced to 6 months’ imprisonment, suspended for 12 months, and ordered to do 120 hours community service within 12 months. While the law would have permitted issuance of a monetary fine, he was spared that as well, and likewise is allowed to continue serving as a company director in the future. The sentencing hearing at Southwark Crown Court followed a criminal cartel investigation by the Competition and Markets Authority (CMA). Mr Snee, the former Managing Director of Franklin Hodge Industries, had previously pleaded guilty to dishonestly agreeing with others to fix prices, divide up customers and rig bids between 2005 and 2012 in respect of the supply in the UK of galvanised steel tanks for water storage. 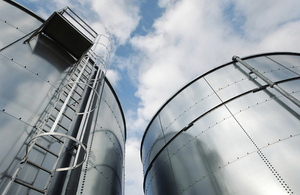 The tanks are used to store water for sprinkler systems in buildings. Mr Snee was arrested in 2012 at the start of an investigation begun by theCMA’s predecessor, the Office of Fair Trading. Mr Snee cooperated with the investigation and, after pleading guilty to the cartel offence in January 2014, was a witness for the CMA at the subsequent trial of two further individuals, who were acquitted in June. As is usual in such cases, the extent of Mr Snee’s cooperation was reported to the trial judge in order that it could be taken into account in his sentencing decision. In explaining the approach to sentencing, His Honour Judge Goymer remarked that “the economic damage done by cartels is such that those involved must expect prison sentences”. The judge indicated that his starting point in this case was that a prison sentence of 2 years was appropriate. Taking into account Mr Snee’s early guilty plea, his personal mitigation and the extent of his voluntary cooperation as a witness, the Judge reduced his sentence by the “higher end” discount of 75%, and concluded that it was appropriate in the circumstances of this case for the resulting 6 month sentence to be suspended. On 24 June 2015, following a trial at Southwark Crown Court in the same case, two directors, Clive Dean of Kondea Water Supplies Limited and Nicholas Stringer of Galglass Limited, were acquitted of the same charges under section 188 of the Enterprise Act 2002. The case was brought under the law as it applied to conduct before April 2014, under which the cartel offence was only committed where the individuals concerned acted dishonestly. Following a change in the law, for conduct after 1 April 2014, it is no longer necessary for the CMA to prove that individuals acted dishonestly to commit the cartel offence. The CMA is also currently conducting a related civil investigation into whether businesses have infringed the Competition Act 1998. No assumption should be made at this stage as to whether the Competition Act has been infringed. The CMA operates a leniency programme for parties who want to admit their involvement in a cartel and also, in certain circumstances, offersfinancial rewards for cartel informants. The Department of Justice collected $1.861 billion in criminal fines and penalties resulting from Antitrust Division prosecutions in the fiscal year that ended on Sept. 30, 2014. Contributing in part to one of the largest yearly collections for the division, five of the companies paid in full penalties that exceeded $100 million, including a $425 million criminal fine levied against Bridgestone Corp., the fourth-largest fine the Antitrust Division has ever obtained. The second-largest fine collected was a $195 million criminal fine levied against Hitachi Automotive Systems Ltd. The three additional companies that paid fines and penalties exceeding $100 million were Mitsubishi Electric Corp. with $190 million, Toyo Tire & Rubber Co. Ltd. with $120 million and JTEKT Corp. with $103.2 million. The collection total also includes penalties of more than $561 million received as a result of the division’s LIBOR investigation, which has been conducted in cooperation with the Justice Department’s Criminal Division. In addition, in the last fiscal year the division obtained jail terms for 21 individual defendants, with an average sentence of 26 months, the third-highest average ever. Why are compliance programmes treated differently (competition vs. anti-bribery laws)? Some issues in white collar criminal defense arise over and over. I’ll periodically post Resource Guides to cover those issues. Feel free to suggest other Resource Guide topics in the comments. Click here for a printable version of this statute of limitations Resource Guide. Generally, there is a 5-year statute of limitations for federal criminal matters. 18 U.S.C. § 3282. Although five years is the default statute of limitations, many federal crimes have a longer period. Capital offenses, as an extreme example, have a limitation period that never expires. If a federal crime is punishable by death, the government can bring an indictment on that crime at any time after the crime has been committed. 18 U.S.C. 3281. Congress has specifically extended the statute of limitations for a number of white-collar crimes. The revised Notice (after its 1997 and 2001 predecessors) retains the 10% and 15% market-share thresholds for agreements between horizontal and non-horizontal competitors, respectively, which create a safe harbor from EC prosecution for an Art. 101(1) violation. The document merely adds formal color and substance to the issue of what types of agreements fall within its “safe harbor” and which fall outside that umbrella. The three classical “by object” restrictions in agreements between competitors are price fixing, output limitation and market sharing (sharing of geographical or product markets or customers). 27 It also follows from the objectives pursued by the de minimis notice, as mentioned in paragraph 4 thereof, that it is not intended to be binding on the competition authorities and the courts of the Member States. 28 It is apparent from that paragraph, first, that the purpose of that notice is to make transparent the manner in which the Commission, acting as the competition authority of the European Union, will itself apply Article 101 TFEU. Consequently, by the de minimis notice, the Commission imposes a limit on the exercise of its discretion and must not depart from the content of that notice without being in breach of the general principles of law, in particular the principles of equal treatment and the protection of legitimate expectations (see, to that effect, Joined Cases C‑189/02 P, C‑202/02 P, C‑205/02 P to C‑208/02 P and C‑213/02 P Dansk Rørindustri and Others v Commission  ECR I‑5425, paragraph 211). Furthermore, it intends to give guidance to the courts and authorities of the Member States in their application of that article. 29 Consequently, and as the Court has already had occasion to point out, a Commission notice, such as the de minimis notice, is not binding in relation to the Member States (see, to that effect, Case C‑360/09 Pfleiderer  ECR I‑0000, paragraph 21). 30 Accordingly, that notice was published in 2001 in the ‘C’ series of the Official Journal of the European Union, which, by contrast with the ‘L’ series of the Official Journal, is not intended for the publication of legally binding measures, but only of information, recommendations and opinions concerning the European Union (see, by analogy, Case C‑410/09 Polska Telefonia Cyfrowa  ECR I‑0000, paragraph 35). 31 Consequently, in order to determine whether or not a restriction of competition is appreciable, the competition authority of a Member State may take into account the thresholds established in paragraph 7 of the de minimis notice but is not required to do so. Such thresholds are no more than factors among others that may enable that authority to determine whether or not a restriction is appreciable by reference to the actual circumstances of the agreement. Brussels bar for U.S. American lawyers: “independent” or “employee”? The [perceived] Belgian prohibition against attorneys having an “employee” status in a law firm – and hence the important, although implicit, requirement that all associates or other non-partner lawyers must be so-called “independents” under Belgian bar rules – does not exist for American lawyers practicing in Belgium. As long as you are an “American attorney” member of either the E- or B-lists of the BRX bar, you can actually be an employee: See para. 5 of Art. 6 in Annex 9 (“CONVENTION CONCLUE AVEC L’AMERICAN BAR ASSOCIATION LE 6 AOÛT 1994”) to the Recueil des règles professionnelles (www.barreaudebruxelles.be/pdf/brochures/recueil2010.pdf), copied below (– let me know if you interpret this differently). 5. L’indépendance des avocats américains étant garantie par les règles professionnelles qui leur sont applicables comme membre des barreaux des Etats-Unis, il ne leur sera pas interdit, par le fait de l’inscription à l’une des listes des avocats étrangers ou pour d’autres motifs, d’avoir le statut d’employé dans un cabinet ou une association. This may have implications for all U.S. firms hiring or moving American associates or of-counsel to their Brussels location. Previously, as I have understood past practice, firms have required their U.S. non-partner attorneys to become ‘independents’ under the Brussels bar rules, which may be a wholly unnecessary (and HR-costly) step. If you have questions, e-mail me.